The aim of this article is to introduce you to the versatility of your new Paglight whilst exposing the secrets of good lighting in such a way that you can continue to build on your skills and enjoy the situations and challenges that beset all cameramen. PAG respects the fact that a news cameraman will never have the time or luxury of a full production lighting team. The Paglight has been specifically designed as a single-operator all embracing camera light, giving you the ability to achieve professional results when presented with the most demanding of lighting situations. Good lighting is an art, yet the basic principles are simple. If you would like to be recognised for the work you produce as a camera operator, it is essential to understand how to control light and achieve a good result with limited resources. Fig.1 The Paglight range of lights. and the names applied to them. The ideal positioning for the lights. 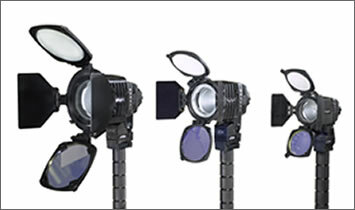 How to make a quick lighting set-up decision. Definitions of common terms used in lighting.